Brandon sits on the edge of fenland, and Staunch Meadow occupies an island of windblown sand within the floodplain of the Little Ouse. Prior to excavation in the 1980s, Staunch Meadow was characterised by earthworks, including a ditched enclosure and a causeway linking the island to the floodplain. Open area excavations (11,750 sq. metres) revealed evidence of a settlement dating from the mid 7th to the late 9th centuries. 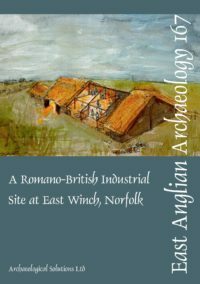 The remains of at least thirty-five buildings were found, some with timber surviving in post-holes, also a raised causeway, a wooden bridge, two cemeteries and two churches. Part of the waterfront was given over to textile processing with structures linked to dyeing and bleaching, and a smithy and a possible bakery were also identified. Thousands of artefacts were recovered, including a gold plaque from the cover of a Bible, coins, bronze pins, fragments of window and vessel glass, and items of personal dress manufactured in silver or gold. There was compelling evidence for literacy with a number of objects bearing runic inscriptions, and fragments of eight glass inkwells. By plotting the finds from the buried occupation surface, it has been possible to demonstrate both the casual loss of objects and the accumulation of rubbish in heaps across the site. 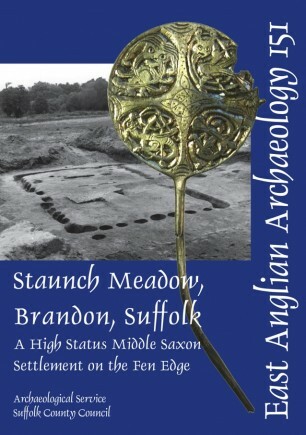 Following a rapid decline late in the 9th century, settlement moved away from Staunch Meadow to the edge of the floodplain but a causeway leading to an enclosure remained. Trial trenches suggest that the enclosure contained a medieval religious building, possibly the chapel of St Andrew that disappears from historical records in the 13th century.